Environmental Valuation & Cost-Benefit News: Cars on Crutches: How Much Abatement Do Smog Check Repairs Actually Provide? Cars on Crutches: How Much Abatement Do Smog Check Repairs Actually Provide? Not as much abatement as has been presumed. Smog check programs aim to curb tailpipe emissions from in-use vehicles by requiring repairs whenever emissions, measured at regular time intervals, exceed a certain threshold. Using data from California, we estimate that on average 41 percent of the initial emissions abatement from repairs is lost by the time of the subsequent inspection, normally two years later. Our estimates imply that the cost per pound of pollution avoided is an order of magnitude greater for smog check repairs than alternative policies such as new-vehicle standards or emissions trading among industrial point sources. In our most conservative scenario, we estimate that each pound of CO, NOx, and HC avoided requires $2.17 in repairs for the average vehicle and $1.27 for gross polluters. Of these three pollutants, CO is by far the least toxic (Small and Kazimi, 1995). If we only credit the NOx and HC abatement, our estimated cost rises by a factor of ten to $17.91 on average and $12.49 for gross polluters. These estimates understate the total cost of the program because they use only the direct cost of emissions-related repairs and exclude factors such as administrative costs and the opportunity cost of driving to and from the station for both failing and compliant vehicles. The results of Fowlie et al. (2012b) provide some context for our estimates. These authors compute engineering-based estimates of the cost of reducing NOx emissions from power plants and newly manufactured motor vehicles that are much less than our cost estimates for reducing tailpipe pollutants of in-use vehicles through I/M. Their preferred estimate for the marginal abatement cost of NOx emissions from new vehicles through federal emissions standards is $0.45/lb of NOx, while that from power generation is $0.95/lb, implying that sizable efficiency gains could be realized by shifting more of the abatement burden towards emissions standards for new cars. 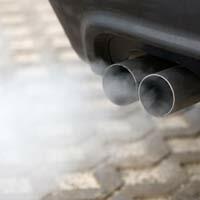 In 1997, Assembly Bill 57 required BAR to provide financial assistance [of up to $500] to qualified low-income motorists needing emissions-related repairs ... or choose to retire their vehicle for a stipend. In our preferred specification the coefficient on abatement implies that a one unit increase in abatement through repairs will be matched, on average, by a 0.41 unit recuperation in emissions by the subsequent inspection. This means that 59% of the unit decrease in emissions will have persisted.... The coefficient on E0j implies that about 28% of the abatement is lost due to the concavity in a vehicle's emissions trajectory. Even if repairs were as good as new, this part of the initial abatement would be lost. The remaining 13% loss in abatement is due to the fact that repairs are not, in fact, as good as new. Depending on model-year group, 38-49% of repair-induced abatement does not persist through the next Smog Check inspection. Fleet-level emissions reductions amount to about 47 million pounds of aggregate emissions, with an abatement cost of $1.69/lb. Because our results show that emissions deteriorate faster after repairs than they would have in the absence of repairs, this method overestimates emissions reductions and thus underestimates abatement costs. Should failure events occur equi-probably at any point in time between inspections, the resulting cost is $2.17 per pound of aggregate emissions avoided. This cost drops to $1.27 per pound of emissions if one only considers repairs performed on gross polluting vehicles. If we instead assume that the abatement loss occurs shortly after repairs, the resulting cost per pound of emissions becomes $3.05/lb for vehicles which failed the emissions test, and $1.77/lb for gross polluters only. Therefore, an almost two-fold improvement in cost effectiveness can be achieved by repairing gross polluters only. A recent report by BAR on the costs and benefits of CAP for the scal year 2011-2012 provides some validation for our estimates (California Bureau of Automotive Repair, 2013). According to this report, CAP spent $9,529,675 to repair 23,507 vehicles during that scal year. The associated emissions reductions were estimated to be 1,772.1 tons of combined NOx, HC and CO on a yearly basis, or 309.6 tons of NOx and HC. Given that the average time between the two I/M cycles is 1.76 years for vehicles failing emissions in our sample, the cumulative expected emissions reductions between two cycles for this recent set of CAP repairs would rise to about 3,120 tons for HC, NOx and CO and to 545 tons for HC and NOx. The implied cost-effectiveness ratio would be $1.53/lb of HC, NOX and CO and $8.74/lb of HC and NOx. These values are slightly lower than our estimates of cost effectiveness under the persistence assumption, and therefore lower than our preferred estimates taking account of emissions recuperation. Both our findings and those reported in this recent report are in sharp contrast to the social figures of cost effectiveness of Smog Check repairs obtained by the California ARB and BAR using the fleet-level model EMFAC (Inspection and Maintenance Review Committee, 2004). In their report to the California legislature, the Inspection and Maintenance Review Committee (IMRC) uses a cost-effectiveness figure for areas subject to the Enhanced Program of $5,317/ton of HC and NOx avoided, that is, $2.66/lb. This figure is about seven times smaller than our estimate for the case of a random repair failure, and ve times smaller than the estimate reflecting persistent abatement.